Before you go ooh and aah about the puppies picture, please remember that by about six months old those tiny little handfuls of joy will be starting to develop into large hairy monsters capable of pushing you and your family closer to the edge than you ever thought possible. Newfoundlands are world-class mud-magnets and can bring an amazing amount of water and dirt into your house. Please read further down this page and view the PDF documents provided. The Newfoundland Club recommend that all puppies are insured. We have an arrangement with Agria Pet Insurance to which breeders can subscribe - it provides five weeks of free insurance for all puppies and a reward when new owners continue onto an annual policy. For the new owners there is the peace of mind of up to £12,500 in veterinary fess cover for accident, illness and injury and the first two months are currently half price. We strongly recommend that anyone considering owning a Newfoundland or purchasing a Newfoundland puppy should read these useful documents which are packed with information and advice. So You Think You Want a Newfoundland? To view these files you will need Adobe Reader. If you don't already have it installed on your device, you can download it now for free from here. Finding a reputable breeder - Newfoundland Club members should abide by a 'Code of Ethics' laid out by The Newfoundland Club. They will have done all the relevant health checks that have been identified to affect the breed at this time. Hip-dysplasia: All breeding stock should have been x-rayed prior to breeding; they will have a score sheet from the BVA which they should be happy to show you for both sire and dam. Heart disease: Prior to mating for the first time all breeding stock must have a colour-flow echo-Doppler examination performed by a Veterinary Surgeon with a Diploma in Veterinary Cardiology (DVC). Cystinuria: The only disease for which we have a DNA test. Providing the status of both parents is known, no Newfoundland need ever suffer from this disease again. Some of our members go one step further and have signed our 'Breeders Charter'. This pledge goes beyond the 'Code of Ethics'. 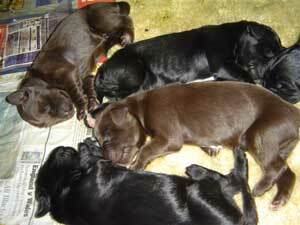 The Kennel Club also has an 'Assured Breeder Scheme' which some breeders have joined. This is similar to our own Breeders Charter and is a pledge to follow good breeding practice. Currently the Kennel Club permits breeders to put two endorsements on registrations – Progeny Not Eligible for Registration and Export Pedigree Not Allowed. Most good breeders will use both of these. For further information please click here. Also, the Kennel Club have a series of helpful information guides available here. The Newfoundland Club has a database listing the results of Heart Tests -the dogs owners have given permission to publish the results. See the Heart Test Database.